One of my personal favourite labels from France are Debemur Morti Productions, active for about a decade and, to my humble opinion, grown up to one of the most important Dark Music labels with more than one hundred releases on their roster, in mean time. In 2012 the label signed French Doom-act Monolithe, resulting in the release of the albums III (review: see update February 6th 2013) and IV (review posted on October 26th 2013). Past summer, Debemur Morti Productions released two other recordings under the Monolithe-banner, i.e. the compilation Monolithe Zero and the 2005-album II. 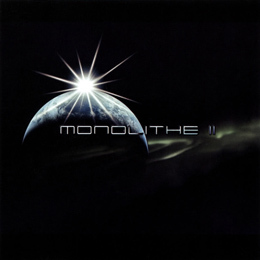 Monolithe Zero compiled both EP’s that were previously digitally-only released (Interlude Premier and Interlude Second). You can read the review done by undersigned on Concreteweb’s update of September 28th 2014, by the way. This review deals with the re-issue of II, which was the second album created by the great French horde Monolithe. II was recorded during winter 2003-2004 and mixed + mastered in spring 2004 in the RR Studio. It was initially released via Candlelight Records in April 2005, and has now been re-released by Debemur Morti in a digital and re-mastered edition with new artwork. II is, once again, a one-track album, which has a total running time of just over fifty (!) minutes. Evidently it contains the ingredients we do know in mean time, i.e. slow yet heavy rhythms, repetitive melodies, melancholic and / or angry atmospheres, deep grunts and hypnotic keyboards. Despite the extremely lengthy duration and the minimal-repetitive structures, I do not get bored one single second, and that’s because of two things: the addition of some nice extras (like the changes in tempo or the grandiose leads), and the fantastic song writing / performance. …and I dare not to forget to mention the massive sound, of course.